clients or customers is essential. A clean building may not get noticed, but a dirty one certainly will! When done regularly, high pressure cleaning can also save you money in the long run by preventing dirt and mould from damaging your outdoor surfaces and therefore maximising their life. That’s where commercial pressure cleaning is so effective. High pressure cleaning (or pressure washing) is a fast and efficient way to enhance the look of your premises, reduce maintenance costs and minimise slipping hazards. 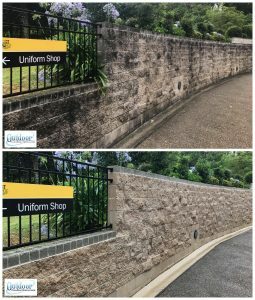 Using the latest high quality commercial-grade cleaning equipment and techniques, we’ll have your commercial or public premises sparkling in no time. Need commercial pressure cleaning services?